Bond Economics: What Does "Fair Value" For Bond Yields Mean? What Does "Fair Value" For Bond Yields Mean? The term "fair value" for bond yields often comes up in market analysis. The term typically refers to where a model predicts yields will be. Since there are a variety of model types, the exact meaning depends upon context. And since not everyone has the same model, investors can have a wide range of opinions as to what the level of fair value is. Additionally, there are implications for the more academic question of what determines the level of interest rates. Fundamental drivers of interest rates presumably determine fair value, but not necessarily observed interest rates. The ratio of the number of words in this article to that question shows the danger of good questions. The answers end up being long and twisty. This article also fleshes out some of the hidden assumptions behind my views on why rate expectations are the best explanation of bond yields. One initial point is that what I am writing about here are the implied yields on fitted bond yield curves (such as the curves produced by the Fed Reserve, and published in the H.15 Report, which I use in the charts within this article). Individual bond yields will tend to depart from these fitted curves, for a number of reasons. For example, the benchmark 10-year Treasury Note yield is often lower than the 10-year fitted Treasury Yield on the Fed H.15 Report. For the purposes of this article, I am not interested in why individual bonds depart from the fitted yield curve. If you want to discuss how my analysis relates to traded instruments, this sort of analysis could be applied to the interest rate swaps, which form a well-defined curve. Since many people are not familiar with swaps, I discuss bond yields instead. pricing bonds on a cross-currency basis. As an example of the last type, some analysts have created models that predict Canadian bond yields as a spread over U.S. Treasurys. I think such models would only make sense under conditions with a currency peg, but that does not seem to stop people from making such models. The spread of a bond yield ("the bullet") over the average yield of two bonds ("the barbell"), where one bond has shorter maturity than the bullet, and the other has longer maturity. Note that if the spread was 10 basis points above a model estimate, we could say: "the 10-year yield is 10 basis points above fair value". (We cannot say much about the 5-year or 30-year in isolation, only the average of the two yields.) This might appear confusing, as we could simultaneously have a model of the absolute value of the 10-year yield, where it is below that model's fair value. But this situation would not be confusing to most practitioners, who are accustomed to jumping between different model usages. But this means that when writing about fair value, you need to indicate what type of model you are referring to. There are a wide variety of mathematical models that can be used to predict the levels of bond yields. However, what I am interested in are those that are useful for certain analytical tasks. I will focus on one important use, long-term yield forecasts (for example, 1-year ahead yield forecasts). Scenario forecasting is a similar exercise (it is a forecast dependent upon certain conditions), and it is possibly more useful in practice. create a forecast of those "fundamental factors" at your forecast horizon. 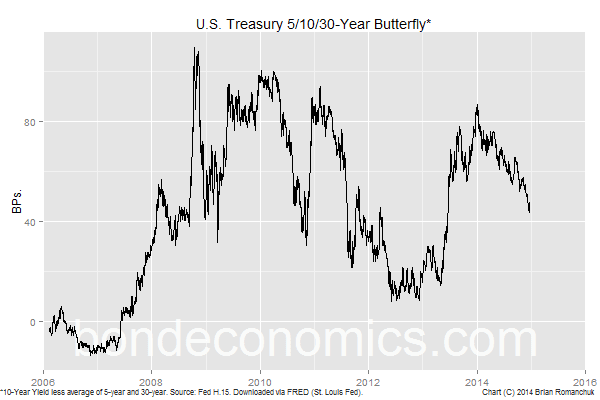 We can see why something like a 5-/10-/30-year butterfly model is not useful in this context. Although it would provide a very accurate forecast, we have replaced the task of predicting the 10-year yield with the task of predicting the 5-year and 30-year bond yields, which is even more difficult. Similarly, just using yesterday's bond yield is typically a very good forecast of today's yield. But this is fairly useless insight for a 1-year forecast; having to predict the 10-year yield 364 days from now is not a lot easier than predicting the yield 365 days from now. 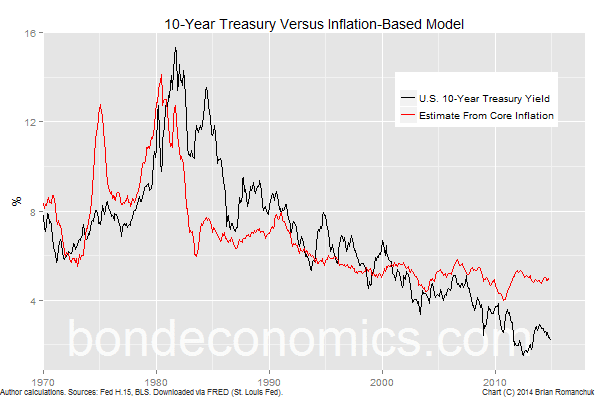 Models that feed back the previous level of yields into their prediction have a cosmetic advantage, but they are nearly useless as a forecasting tool, since you have to feed in predictions of the path of interest rates. As an aside, this two-step procedure is somewhat qualitative, and does not fit within the accepted doctrines of how to analyse finance within academia. As a result, modern financial academic work has little to say about how bond yield models are used within the financial industry. This is why it is possible that market analysts can write about this subject without having to pay much attention to the vast flood of articles that the modern university system churns out. The fit is actually not that bad given the extreme simplicity of the model, although the quality deteriorated recently. I expect to discuss this model further in a later article, as I can use it to explain the weaknesses of models that are not built around rate expectations. In any event, to forecast the 10-year yield one year from now, you just need to somehow forecast core inflation one year from now, and then you can read off the predicted yield from the above equation. Markets can deviate from "fair value" for a variety of reasons, but there are limits to how far out of line they can be. You take positions if the deviation from fair value is too extreme. You do not worry about explaining why the deviation exists. There are non-modelled factors that tend to vary from cycle-to-cycle. You compare the deviations from fair value to what you think the effect of those factors should be, and thus you can judge whether the deviation from fair value appears justified. The last option is how some analysts have approached the question of modelling the effect of Quantitative Easing (QE); they assume that the deviation from their model's fair value is the result of QE. This ignores the possibility that their models may have a poor fit to the data to begin with. And if your boss wants you to find that QE was highly effective, calibrate your model so that you get a big overestimate of recent yields (such as that seen in the model above). The first approach ("supply and demand") is superficially appealing. The bond market is intermediated by market makers, and they have to set prices in a fashion such that their positions do not get unbalanced too far in one direction or another. They therefore have to balance what they think are "supply and demand curves". Any change in yields can be explained by a shift in those curves. The second approach is what I would view as a simplistic version of rate expectations: the forward curve represents investors' expectations for the path of short rates, and any shift in the markets represents a shift in rate expectations. This would be a straightforward interpretation of the mathematics in interest rate option models; forward rates correspond to expected future short rates, and they evolve according to some random process. Although I probably write some commentary that is consistent this interpretation, I view this as being too simplistic an interpretation of what the "rate expectations" theory is. I will discuss what needs to be added in later articles. The problem with these approaches is that since they can explain any observed level of interest rates, they are useless for forecasting purposes. That is, pretty well any level of bond yields could be "forecast". For those readers with a philosophical bent, they are not falsifiable. This discussion has some implications for a somewhat academic topic: what determines interest rates ("interest rate formation")? If we throw out the approaches that are not falsifiable (such as "supply and demand"), we see that any quantitative approach implies some form of model. (Addressing the topic with a more literary approach that avoids the use of mathematics probably creates another unfalsifiable theory.) And we see that all models have model errors (those that are in the public domain, at least). And this is unlikely to change. For example, the 10-year Treasury yield varied between 2.07%-3.01% in 2014 (based on the Fed H.15 data; there was a intraday spike lower in October). I would argue that it would be hard to justify such a wide trading range purely on observable economic and financial data; the market ran back and forth based on technical factors and non-forecastable "animal spirits". This makes it hard to test any theories about interest rate formation. Since any approach will have sizeable errors in their forecast, it will likely be rejected by statistical tests. The best that we can probably hope for is a method that has more subdued errors than other techniques. That is, we can hope to explain why the 10-year yield varied between 2-3% in 2014 instead of being between 5-6%, but we probably cannot explain the precise level of yields on any given day in 2014. * Or it could be the negative of how I define the spread here. I have seen both conventions used. As long as you are careful in specifying what you are doing, it does not matter too much. ** The terms "barbell" and "bullet" are also used in conjunction with portfolio structuring. A "bullet" portfolio is one where you have removed most of the high and low duration bonds from your holdings. A "barbell" portfolio is one where you remove the medium duration bonds. Sometimes the term barbell is extended to indicate situations where you are holding the extremes of another risk distribution. For example, you could sell your investment grade corporate bonds, and hold government bonds (lower credit risk) and high yield ("junk") bonds (greater credit risk) to create a "barbell credit portfolio". *** The fact that it is easier to model relative value relationships than the level of interest rates explains why dedicated fixed income managers tend to focus on relative value as a means to beat their index. (Overweighting corporate bonds, which is a bread and butter position for many funds, can be viewed as a form of relative value, although corporate spreads are less predictable than yield curve relationships.) It is difficult to make money butting your head against the direction of interest rates. However, fixed income relative value is not particularly interesting to write about unless you are making investment recommendations (which I cannot do on my website for legal reasons).